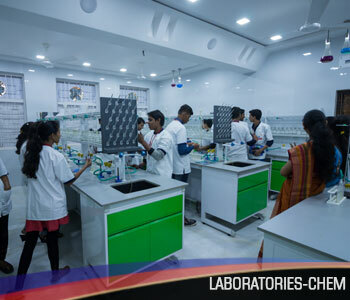 Chemistry laboratory is a place where students either are extremely playful or very scared of using chemicals. Prakash College has state-of-the-art Chemistry lab that lets you sat it your curiosity by moving the students in the correct direction. The equipments are all calibrated for zero error. The table tops are made of epoxy resin and phenolic resin and can withstand the hardest chemical and leaves no marks or reactions on surface. The lab is created to be fire resistant and handle any kind of mishap. The heights and widths of the furniture are all created keeping in mind the Indian physique of students. All the drawers and cupboards doors are made for soft closing. The windows and environmental friendly lighting are especially designed keeping in mind visibility. Our laboratories with advanced equipments and facilities aid and stimulate our students for them to learn best with practical knowledge. It empowers them with better comprehension and moves their inquisitiveness in the correct direction.